OTTAWA — Canadian authorities have helped thwart the efforts of another group of Tamil refugees to get to Canada, The Huffington Post Canada has learned. Speaking on condition of anonymity, government sources confirmed that Canadian officials have worked very closely with the government of Togo, the small West African nation, to stop a potential boatload of Sri Lankans asylum seekers from arriving in Canada. A spokeswoman in Immigration Minister Jason Kenney’s office said human smugglers are a threat to the integrity of Canada’s immigration system. “We have been clear: Our government will do everything in our power to stop the human smuggling boats,” Candice Malcolm wrote in an email. The BBC reported Tuesday that some two hundred Sri Lankan refugees were stranded in Togo after having been duped by an agent and dumped there. They were being detained in an open stadium after having been arrested and detained in late October on charges that they overstayed their visas, the BBC said. The potential refugees were taken from Colombo, Sri Lanka, to Mumbai, India and then to Addis Ababa, Ethiopia before arriving in Lorne, Togo by air on visitor visas, the report states. They were apparently being assured that they would be taken to Ghana and from there to Canada by boat. The Canadian government’s human smuggling task force has been actively working with foreign governments and local law enforcement agencies to push Canada’s borders “out” and stop new boats from arriving. This summer, Canadian officials took credit for stopping the MV Alicia in Indonesia. Although those on the boat claimed to have been aiming to enter New Zealand, there were “other indications on the boat that they wanted to go to Canada,” New Zealand’s Prime Minister John Key said at the time. Sources confirmed that CSIS and RCMP officials had been working to monitor that boat's trajectory. 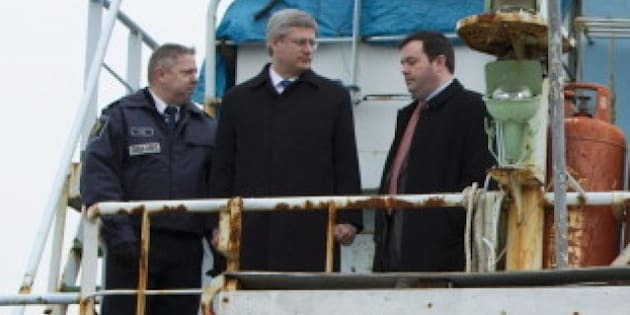 Public Safety Minister Vic Toews, Immigration Minister Jason Kenney and Foreign Affairs Minister John Baird have all noted that Canada remains an attractive target destination for human smugglers and for those wishing to queue-jump the immigration system. The Sri Lankan detainees in Togo say they have been visited by officials from the United Nations High Commissioner of Refugees, International Organization for Migration, local immigration officials and representatives of the Canadian government who all suggested it would be better for them to be deported than placed in a local prison, according to the BBC. In 2009, the vessel Ocean Lady arrived on Canada’s West Coast carrying dozens of Sri Lankan migrants. Ten months later, the MV Sun Sea, arrived carrying 492 Sri Lankans who had boarded in Thailand. The influx of Sri Lankan refugees led the Conservative government to introduce stiff new regulations to deter queue-jumpers and prevent human smuggling operations. The bill titled “Preventing Human Smugglers from Abusing Canada's Immigration System Act” was re-introduced in June after the election campaign but has yet to be sent to committee for study. “The opposition and the illegal immigration lobby have been wrong and irresponsible in downplaying the threat Canada faces from illegal human smuggling boats,” Malcolm, Kenney’s spokeswoman told HuffPost. Like Huffington Post Canada's Ottawa Bureau Chief Althia Raj's reporter page on Facebook and follow her onTwitter for all the latest news from Parliament Hill.